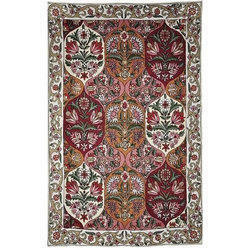 We have made a notable name in the market by providing a premium quality assortment of Chain Stitch Rug. We are actively supported by the team of skilled workforce, highly involved in offering a broad array of Chain Stitch Rugs to our esteemed customers. Our offered rugs are fabricated at our end by making use of utmost quality raw material and high end technology in accordance with international quality norms and standards. Shipping Coverage: We ship items worldwide. Chain stitch, be it in wool, silk or cotton, is done by hook rather than by needle. The hook is referred to as "aari", and while maintaining the same quality, hook work covers a much larger area than needle work in the same amount of time. All the embroidery is executed on white cotton fabric, pre-shrunk by the manufacturers. This stunning cotton base rug with chainstitch polysilk hand-embroidery in a beautiful butterfly design is finshed in a blend of matching colours. It is available in different colour combinations, shapes, patterns and sizes. 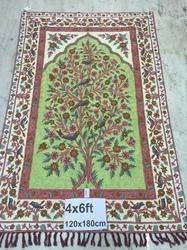 With our huge industrial knowledge and expertise, we are highly instrumental in offering to our patrons with a highest quality assortment of Crewel Hand Embroidery Chain Stitch Rug.